Are you looking for a way into publishing? 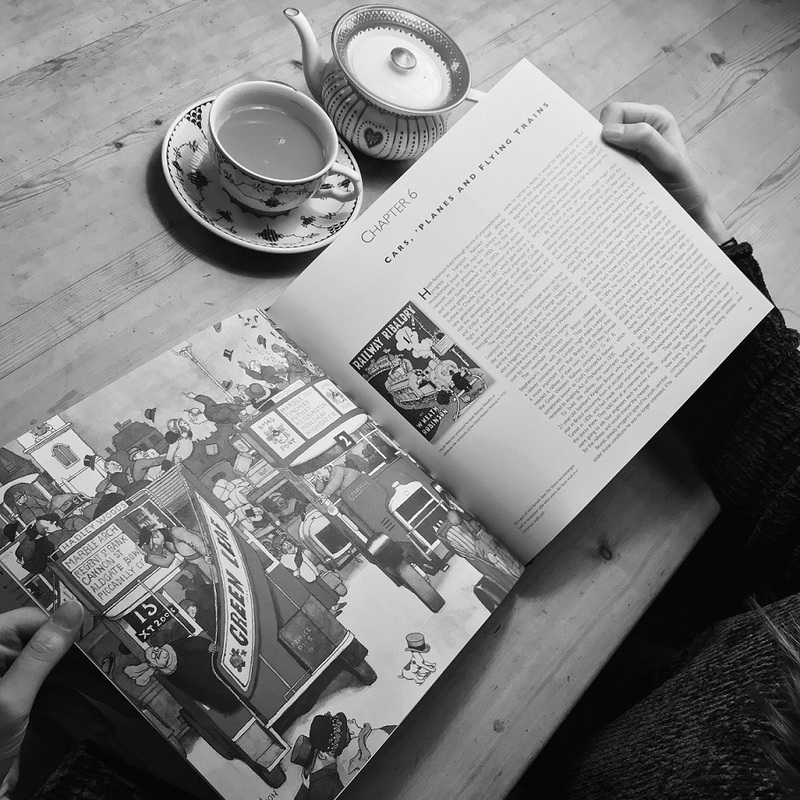 Our publishing traineeships introduce recent graduates to every aspect of the industry. We give you the opportunity to work in the editorial, sales and marketing, production and foreign rights departments. We are recruiting now. Do you need a bit of help going uphill? Ideas for presents this Christmas? 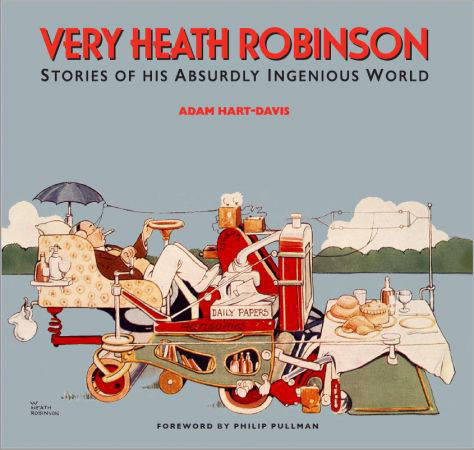 Take a few tips from the master contraptioneer Heath Robinson, who has a solution to every problem. We invite you, our readers, to join our new membership scheme. 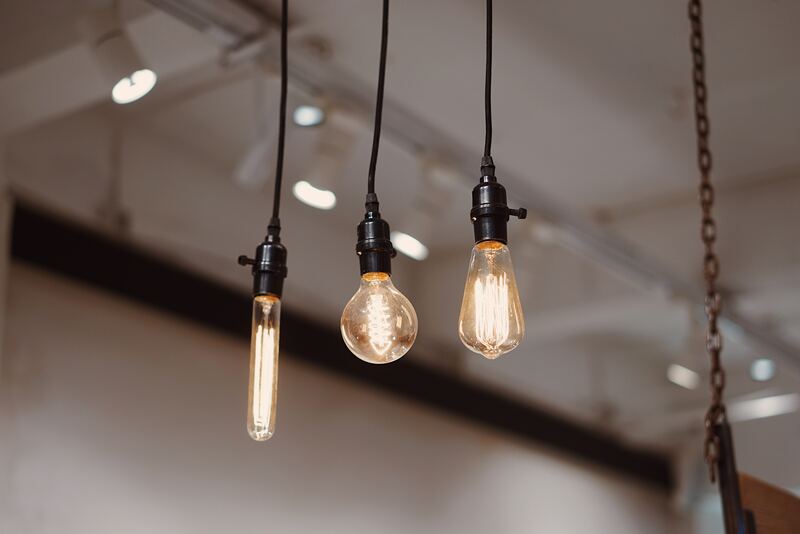 We publish books not because we want to make money, though obviously we must, but because we’re excited and enthralled by the idea of creating something new and shining light on subjects that may have been overlooked or under-appreciated. 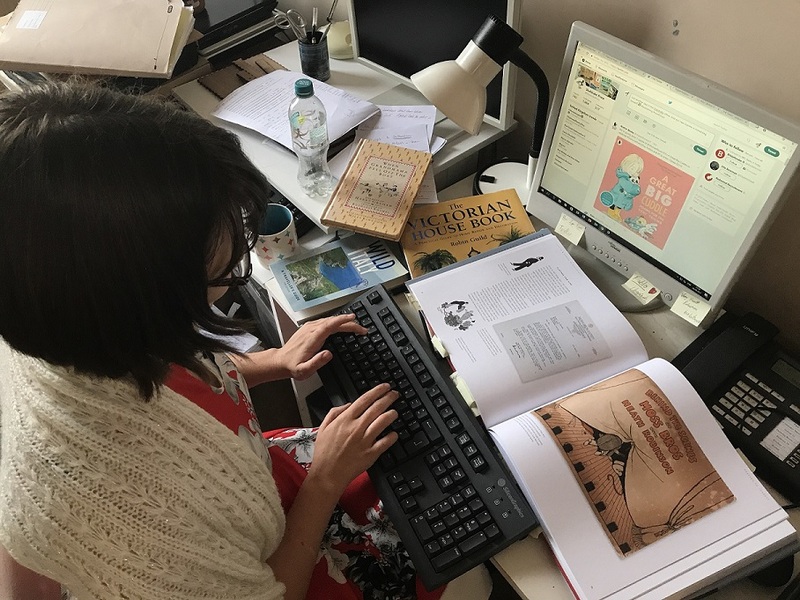 As a Sheldrake Member you will be closer to the editorial process in which we engage every day and you will be able to obtain our books at a preferential price. For the pleasure of reading. If you had to name places with literary associations, you might say Haworth, Stratford, the Lakes and Knole, but hardly Yeovil. If anything, the town is known for making gloves, helicopters and Yeo Valley yoghurt. 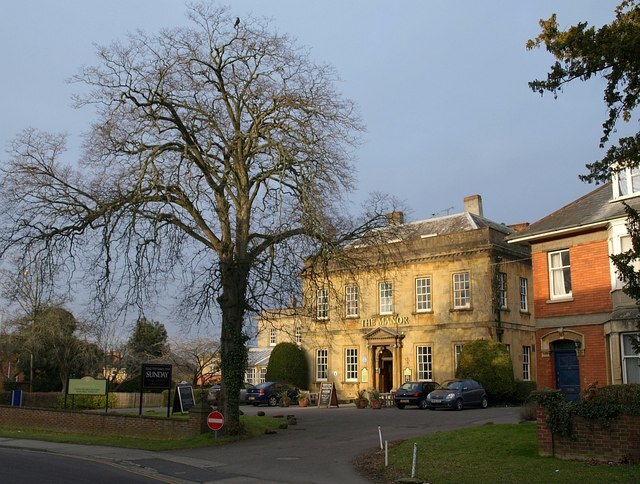 But at the end of October a thriving literary festival takes over the Georgian Manor Hotel, built of local Ham stone, and other venues in the town centre. Though few people know it, Yeovil is also linked with Thomas Hardy and his Wessex novels. 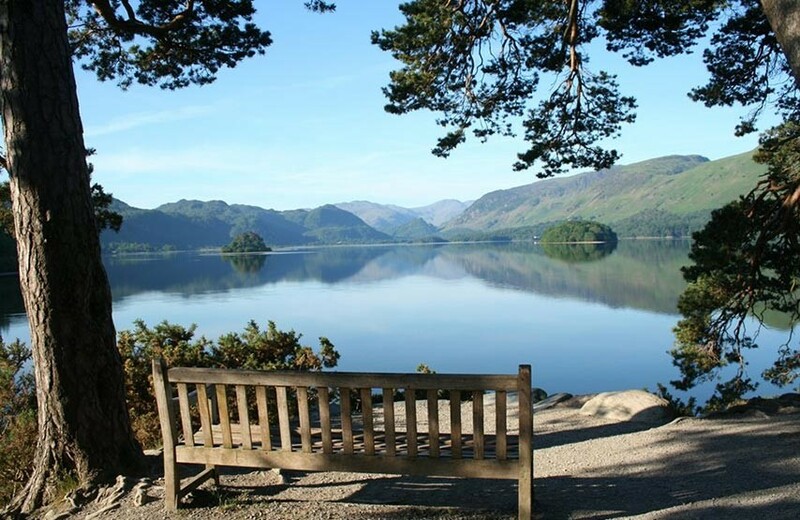 Chances are the name Shute will not ring a bell, but the Shute Festival of Literature and Landscape is here to change that. 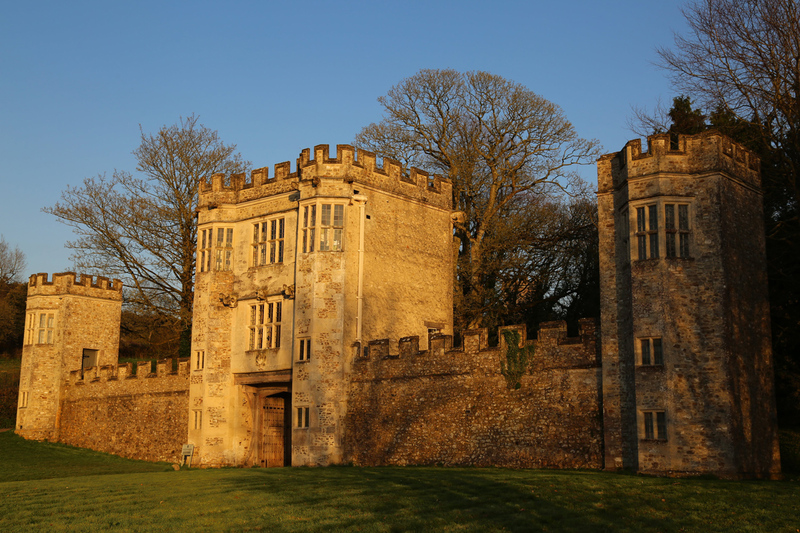 Offering a diverse range of talks on writing, film-making, exploration and landscape, the festival will whisk you away to East Devon for a weekend retreat in late September. Say Henley and you think rowers, blazers, boaters, marquees and boat houses, Leander Club and Enclosures. 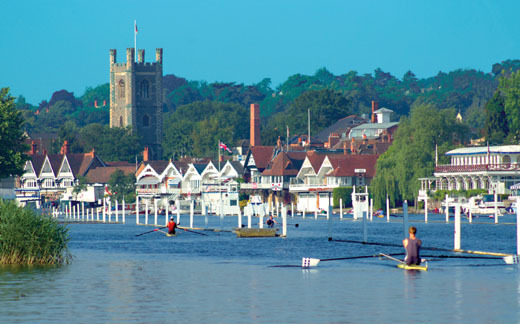 But alongside the 179-year-old Henley Royal Regatta there is a stripling challenger, now in its twelfth year, the Henley Literary Festival. 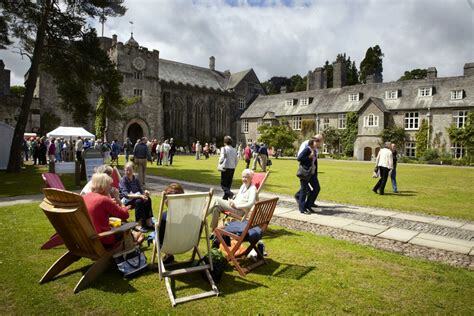 Discussions in the garden, talks in the Great Hall, the Barn and the Dukes Room, word schools, poetry breakfasts, story-telling, comedy events, theatrical performances: words and ideas in all their forms and combinations are on offer at Ways With Words, the literary festival that’s held this July in the idyllic setting of Dartington Hall. 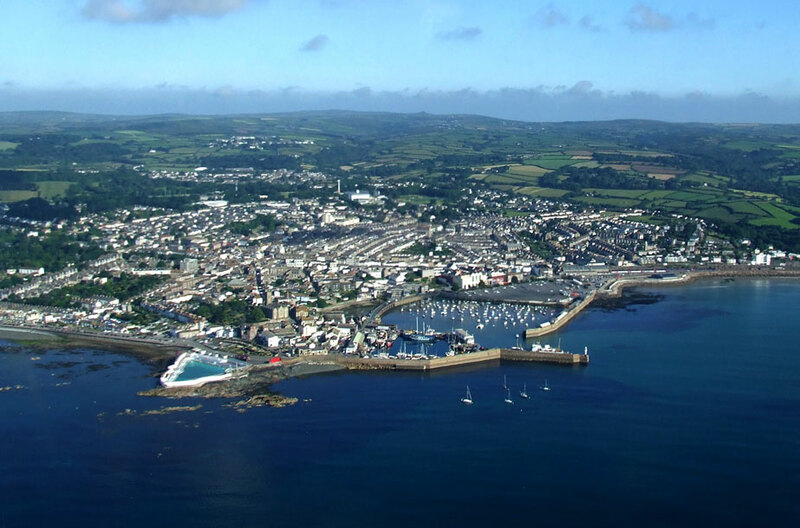 Let your imagination take flight this summer by going to the Penzance Literary Festival. 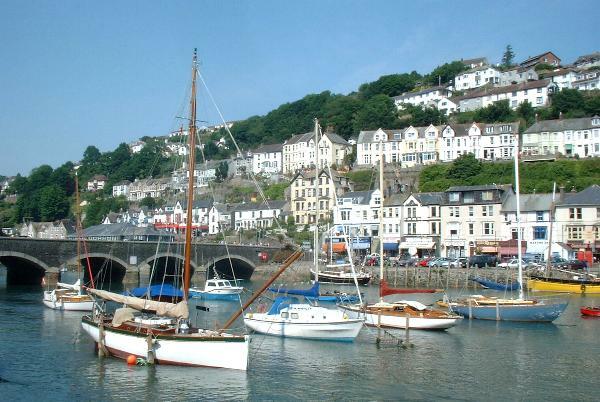 Between 4th and 7th July writers will be talking about their latest books, focussing on flights literal and metaphorical, in the friendly setting of this fishing port and holiday resort on the Cornish coast. How do you seduce a most attractive ‘beaut’ in a one-piece bathing suit? And how do you lure a mermaid on to the beach at Margate? For the answers, take up our two-for-one Father’s Day offer and follow the page references. 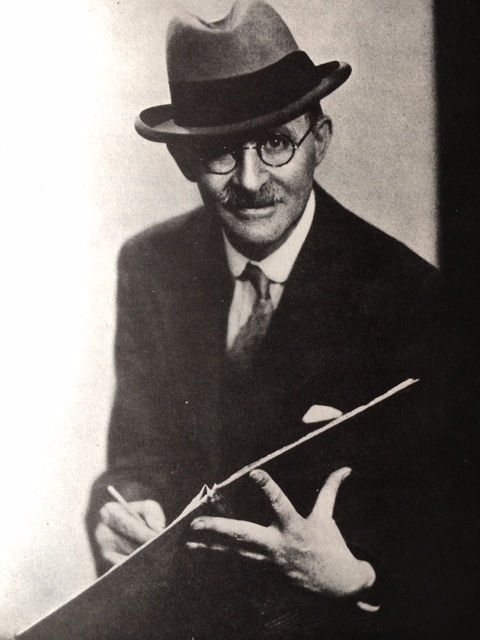 On 31st May 1872 William Heath Robinson was born in Hornsey Rise, north London. 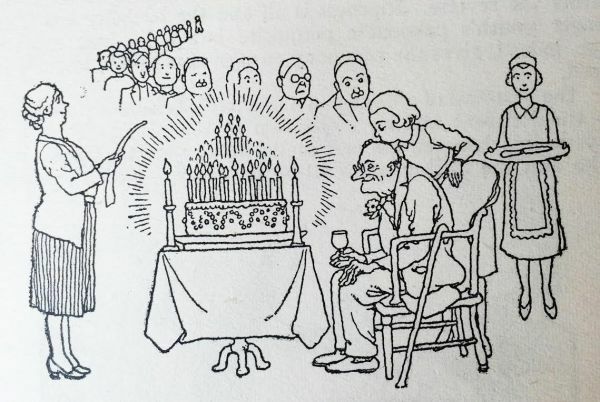 Over the next 72 years he made a huge name for himself as a humorous illustrator. He was as well known as Picasso. Going one better, he got his name in the English dictionary as both a noun and an adjective. 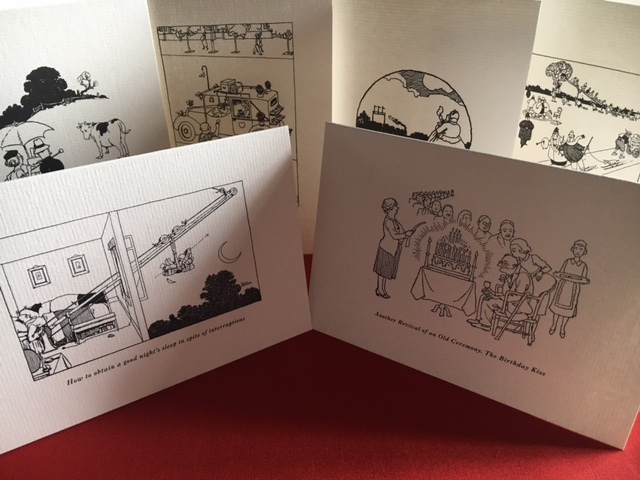 To mark his birthday, we offer the De Luxe limited edition of our book Very Heath Robinson at a third off the published price. 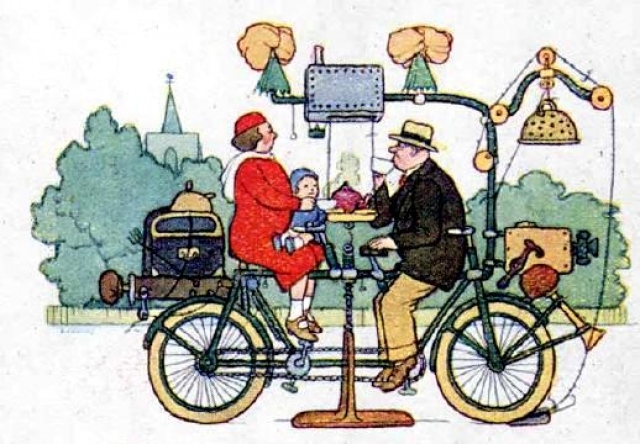 Heath Robinson’s Weekend All-Weather Tandem makes family excursions possible. Equipped with a horn, twin umbrellas and anti-lock braking system, it can cope with every eventuality. 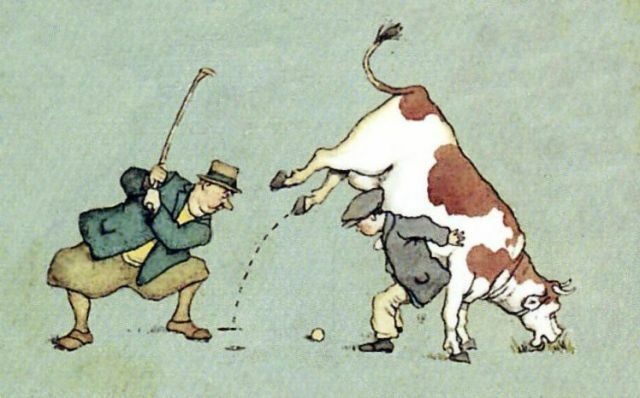 We’re running a competition to caption this picture. 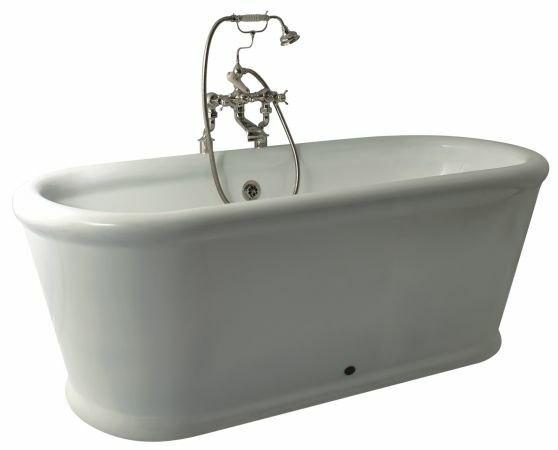 Send us your best idea for a chance to win a Very Heath Robinson De Luxe Edition. 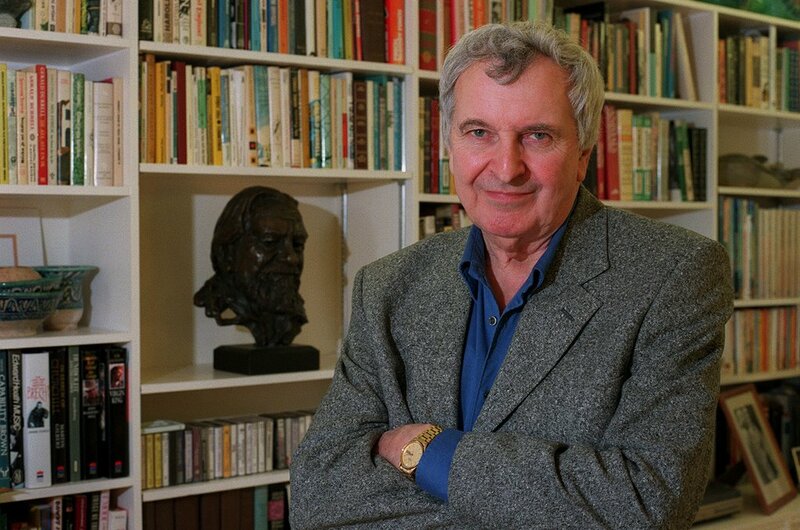 We are very sad to announce that Douglas Botting has died at the age of 83. 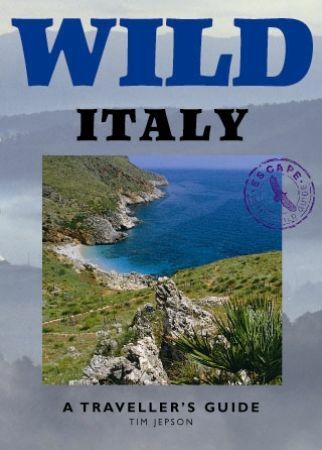 Author of Wild Britain: A Traveller’s Guide and General Editor of the Wild Guides series, he is a towering figure in the literature of wild places. To him we owe an eternal debt for capturing in beautifully chosen words the harmonies of the natural world of which we are part and on which we depend for our survival. At the back of an old brewery in Taunton’s historic Bath Place lies Brendon Books, an independent bookseller that specializes in maps and travel. 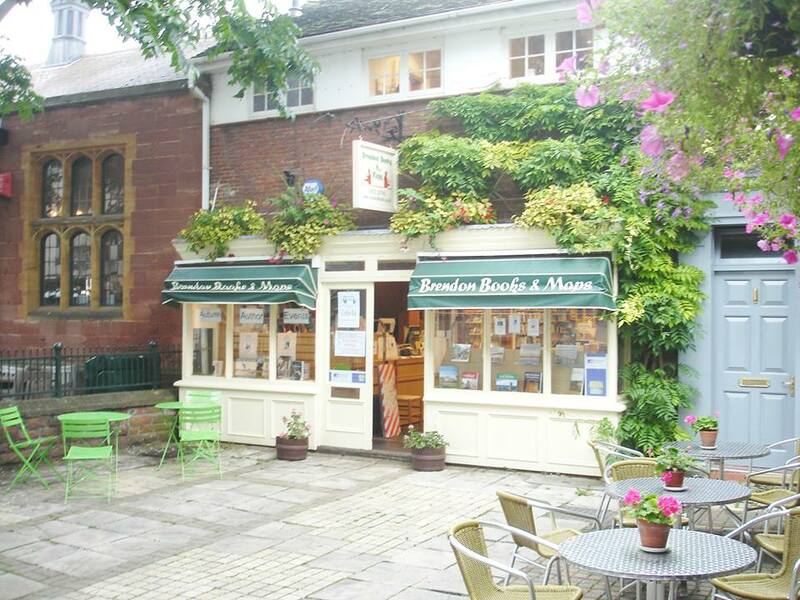 Every November the bookshop hosts the Taunton Literary Festival, now in its seventh year. 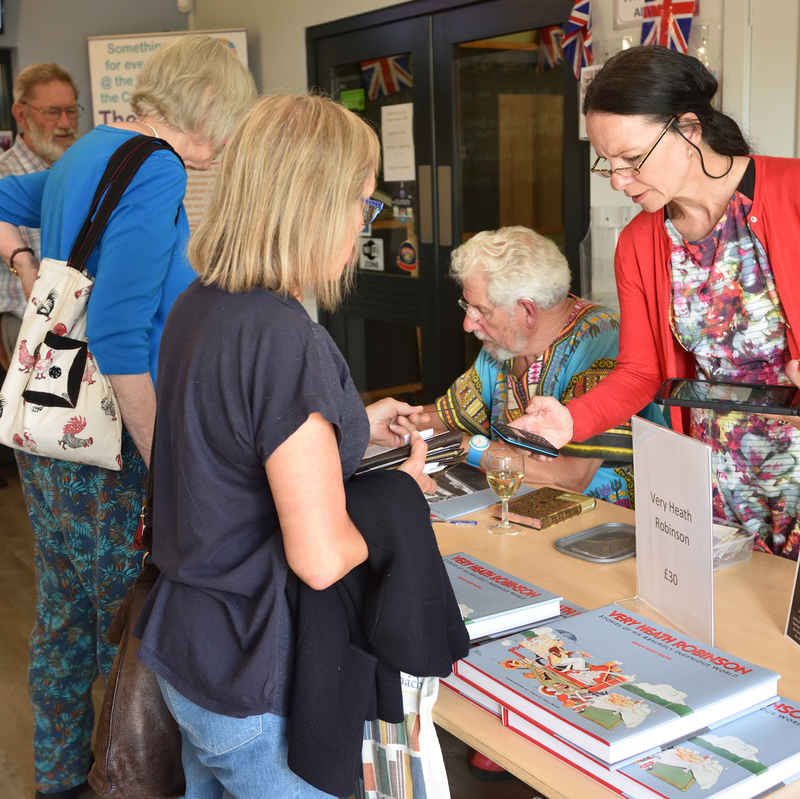 Literary festivals like this are a sign of the new energy in the world of independent bookselling. 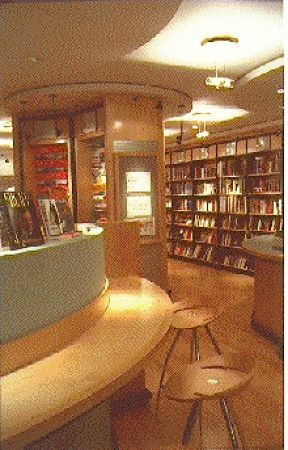 Publishers, booksellers and authors today celebrate the UK and Ireland’s second national Bookshop Day. 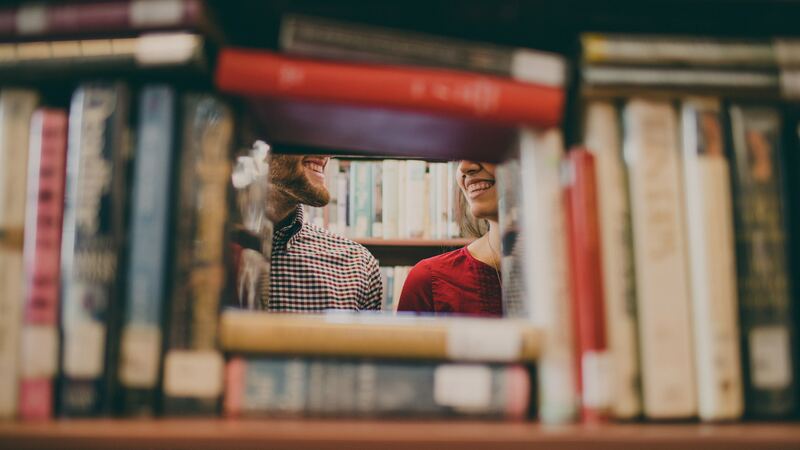 To mark the occasion, we announce a series of bookshop interviews that we will publish over the next three months as the days draw in and you long for a good book to read by the fire. More babies are born in late September and early October in England and Wales than at any other time of the year: nearly 2,000 a day. If you need a gift to greet one of these new arrivals, we’re offering a book and card with illustrations by well-known artists. You can also dance with robots, date by slot machine and boil an egg straight from the chicken, thanks to Heath Robinson. 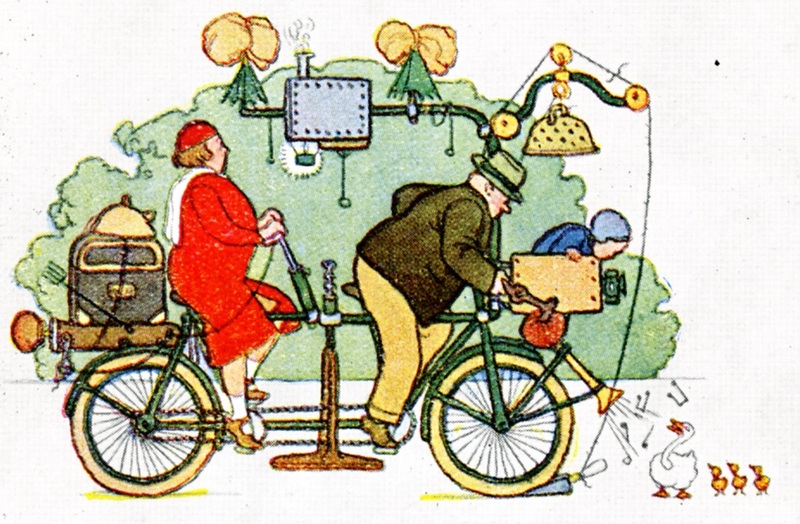 Helpful devices to do all these things are now on view in the big new book we publish today, Very Heath Robinson. 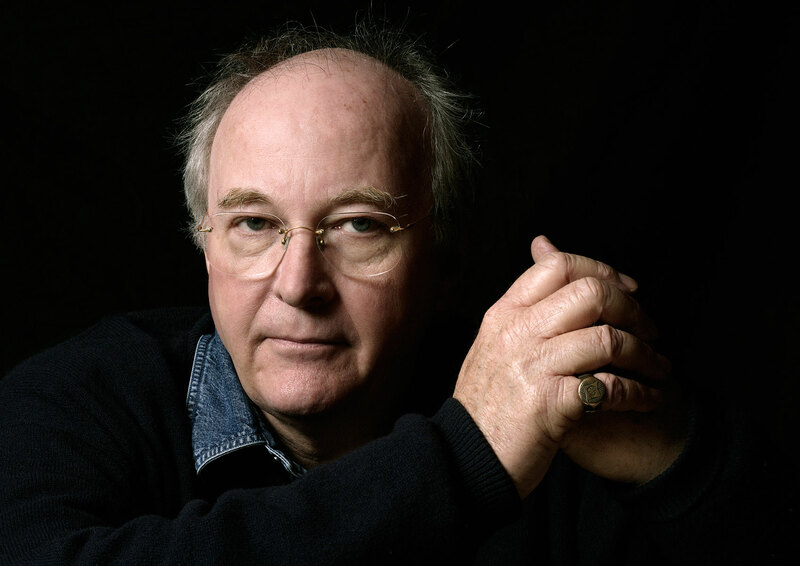 The author is Adam Hart-Davis, presenter of What the Romans Did for Us, and Philip Pullman has written the Foreword. 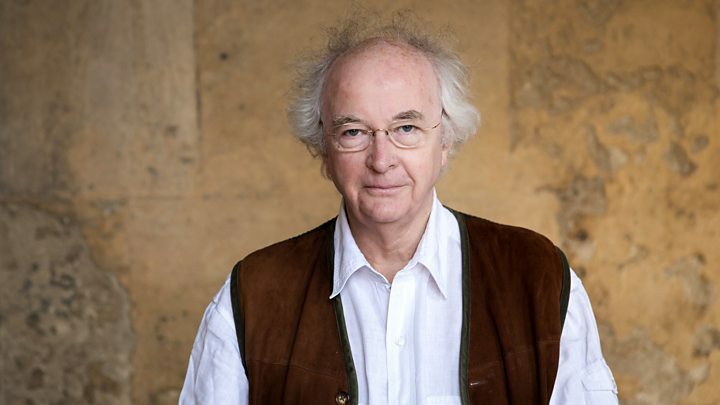 Philip Pullman has written the Foreword to Adam Hart-Davis’s new book Very Heath Robinson, celebrating the work of one of Great Britain’s best-loved artists. 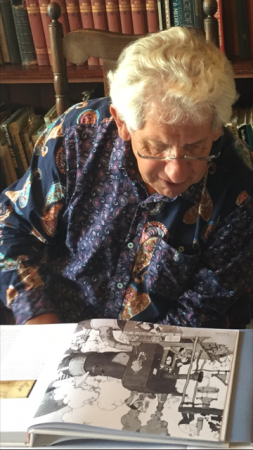 Adam Hart-Davis has delivered the text for our spring book Very Heath Robinson, the pictures have been laid out and the colour proofs approved. In a few days we’ll be ready for press. 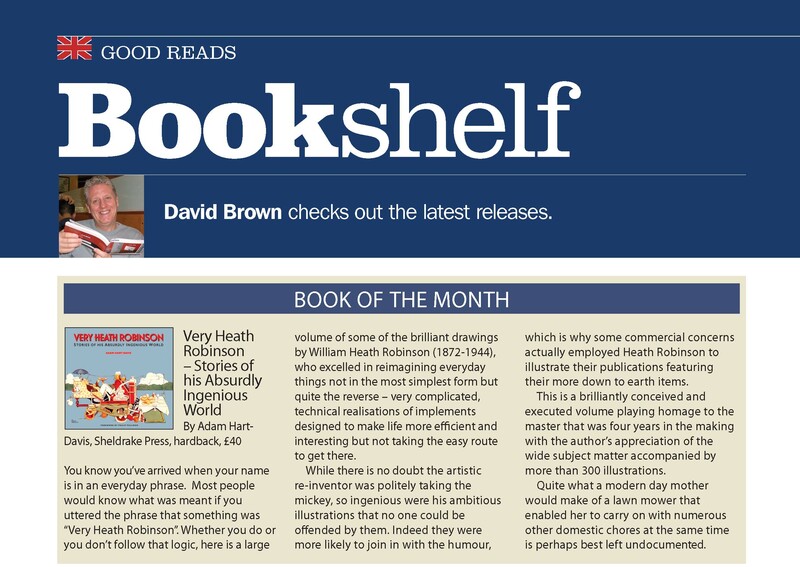 We are running a mini-quiz in The Oldie magazine. What is the etymology of ‘crap’, we wanted to know. 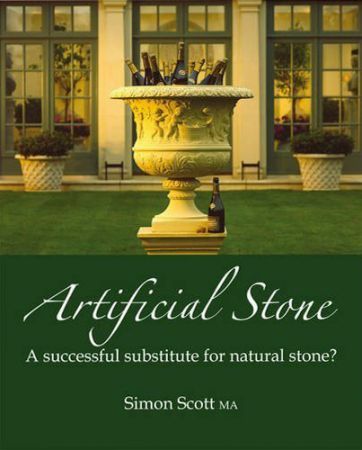 Curiously, the answer is to be found in The Victorian House Book. 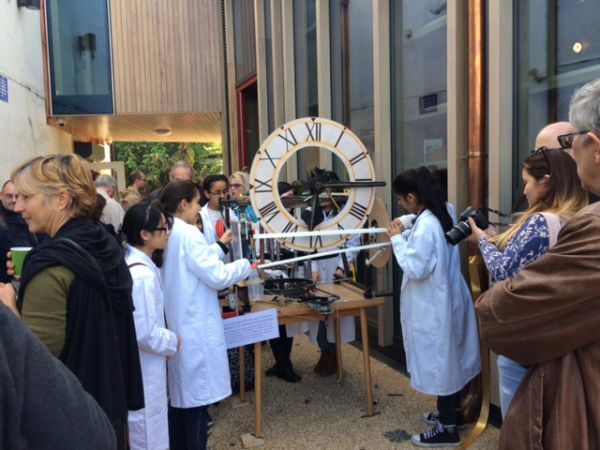 We would like to congratulate The William Heath Robinson Trust on passing their fund-raising target of £32,500 on Kickstarter. 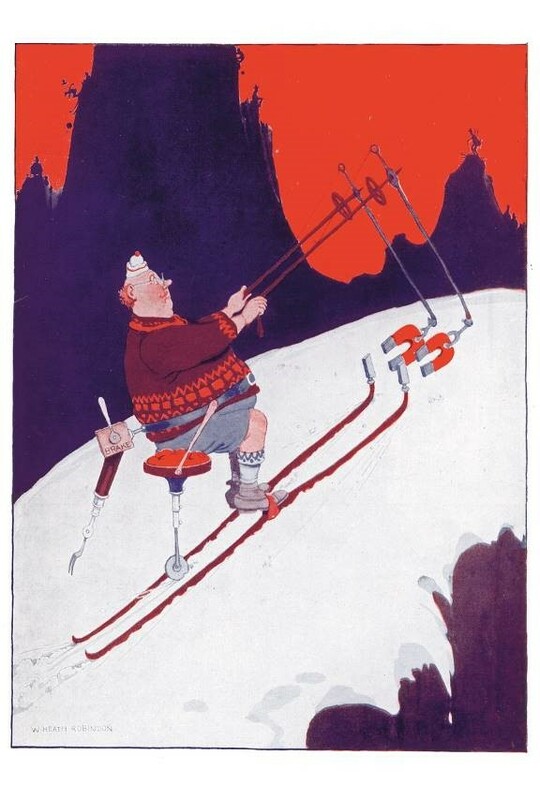 We support The William Heath Robinson Trust in their plan to build a Heath Robinson Museum in Pinner, north London. Their fund-raising campaign on Kickstarter is 93 per cent funded. They need help to get to 100%. 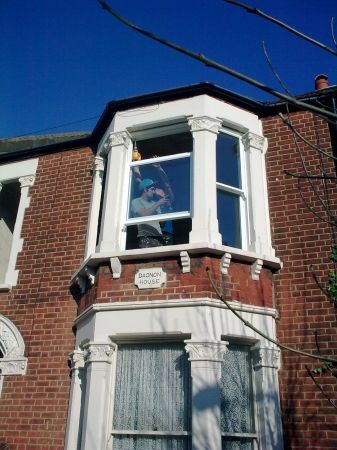 A lot of damage is done to Victorian houses in the name of energy conservation, most frequently by replacing original sash windows with inappropriate double-glazed units. As Denis Meehan explains in his report on Energy Conservation in a Victorian House, changing the windows is one of the last things you need to do. Our new Pinterest page will help you to explore some of the topics that we specialise in: Victorian restoration, wilderness travel, traditional children’s illustration and quirky design. Get a free copy of When Grandmama Fell Off The Boat when you buy The Victorian House Book. 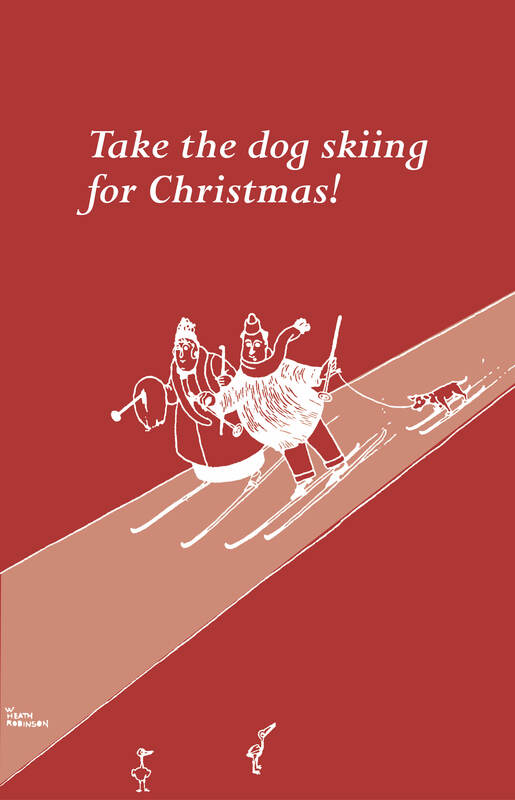 This should help fill the stockings and provoke a few cheeky giggles. 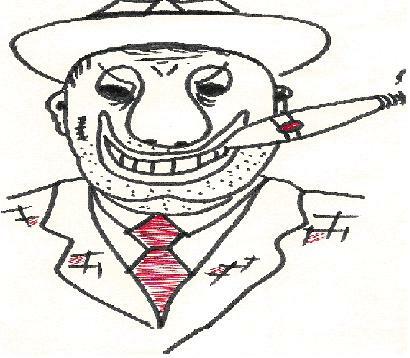 What brings a smile to the face of this cigar-toting stranger? Rubber feet, it turns out. Gangster Pete has rubber feet. If this sounds faintly ridiculous, you are at one with the judges of the Ruthless Rhyme competition. Some of the entries, they decided, while not ruthless, were memorable for their oddity or absurdity. 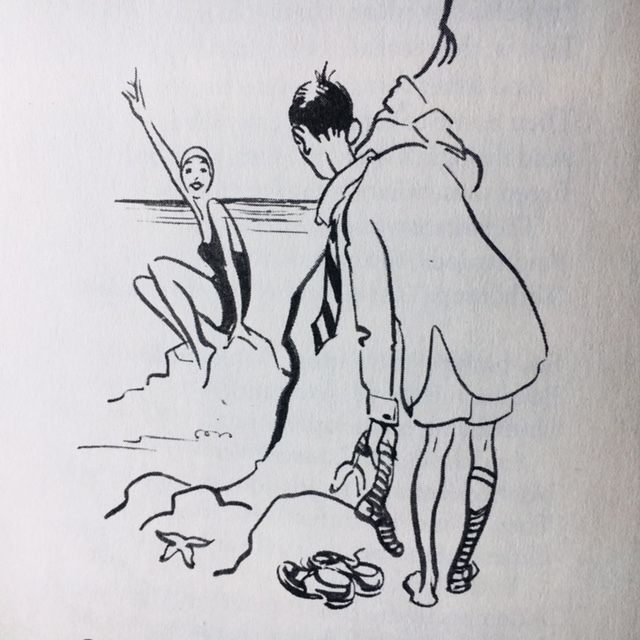 To celebrate the solstice and all things summery, head to the Riviera ‘And there upon the sunny sands’ relax with a good old laugh, courtesy of Harry Graham. We guarantee the health benefits of When Grandmama Fell Off The Boat. As luck would have it, it’s 50 per cent off this month. 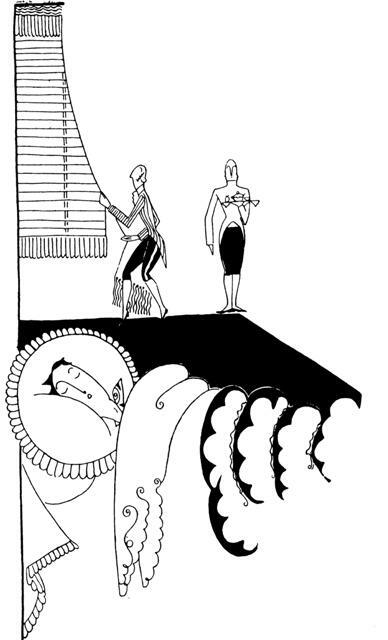 If you admit that men should be permitted to be men, at least on one day of the year, we suggest a late lie-in for the head of the household and a politically incorrect gift: a volume of humorous verse by the charmingly callous Harry Graham. 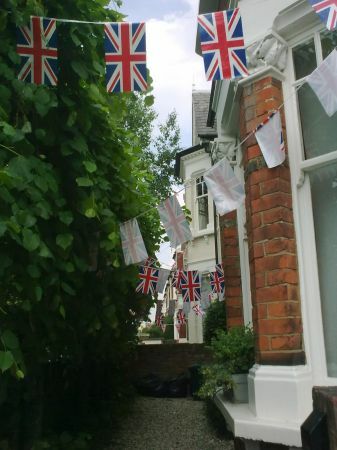 Can You Trump Our Bunting? 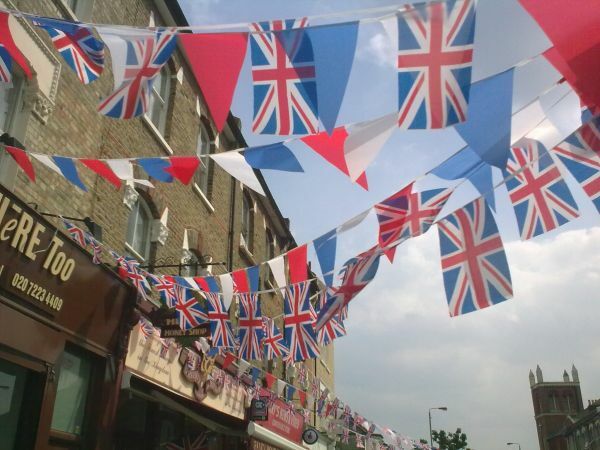 Add an innovative caption with the word bunting in it, and you’re done! Our resident poet, Angela Perkins, has written some Ruthless Rhymes to mark the Queen’s Diamond Jubilee. The first, entitled Royalist vs Republican, is now published on our Blog. 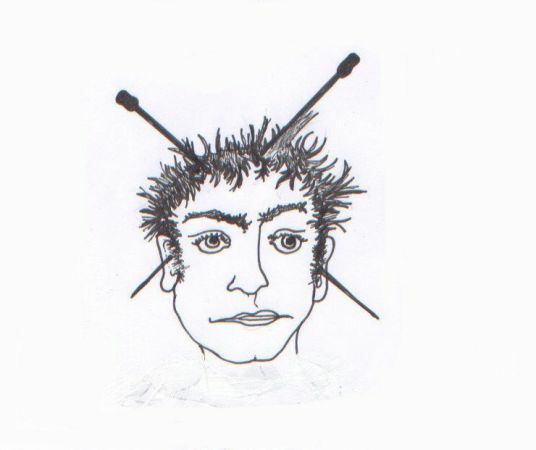 The judges in the Ruthless Rhyme Competition were surprised to see illustrations accompanying some of the entries, including one of a man with knitting needles through his head. What could have led him to such a plight? Was this a case of true ruthlessness? 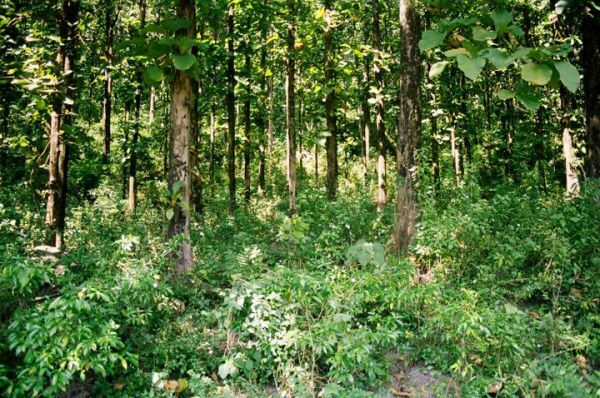 In our Wild Escape Competition, Liz Cleere described a trek in the eastern Himalayas to visit a slice of wild India that people rarely see and Helen Moat recounted the magical night she and her young son Jamie spent in the company of glow worms in Britain’s Peak District. Liz Cleere is the winner. The judges have announced the 12 poems short-listed in the Ruthless Rhyme competition. All are now published, along with audio readings, profiles of the writers and judges and a selection of rhymes that deserve mention for being creative or ridiculous. The runner-up in the Ruthless Rhyme Competition is Rosemary McDougall with her Good Intentions. She scored 20 points, just one behind Angela Perkins with George’s New Year’s Resolution. In third place is Elizabeth Francis with A New Year’s Hobby and a score of 13 points. You can read all three rhymes in our Blog. The winner of the Ruthless Rhyme Competition is George’s New Year’s Resolution, written by Angela Perkins. George’s dream was to buy a little place in France, but Mavis stood in his way. A coup de something or other was required. To see how George resolved this petit problème, click here. The contestants in our Ruthless Rhyme Competition have reached the last fence. After a process of ruthless elimination, ten judges have reduced a big field down to a short list of 12. Only the finishing post lies ahead. 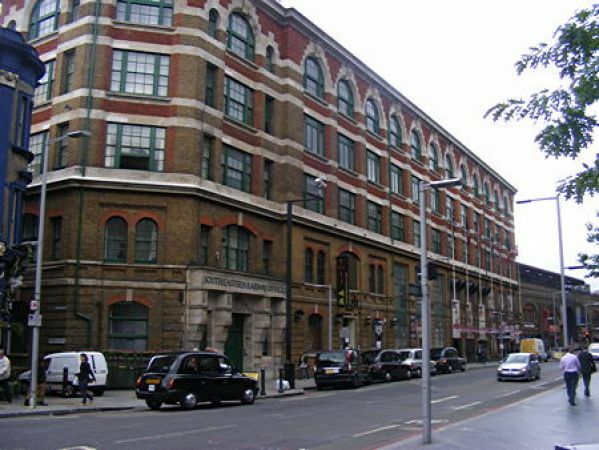 The former South Eastern Railway Offices at 64-84 Tooley Street were built between 1897 and 1900 by the architects Charles Barry and Son. 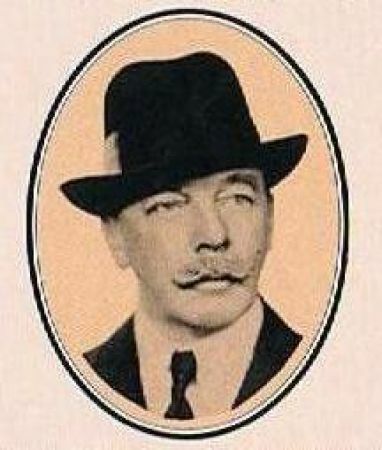 Charles Barry Sr created the Gothic extravaganza of the Houses of Parliament. This is the only surviving commercial building by his son, and it is an important part of the London Bridge conservation area. Do we really want to swap this for Network Rail’s new entrance to London Bridge station (see our Blog)? 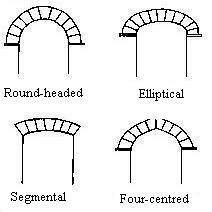 The numerous terms used in The Victorian House Book are defined, with illustrations. To download this glossary, please register below. 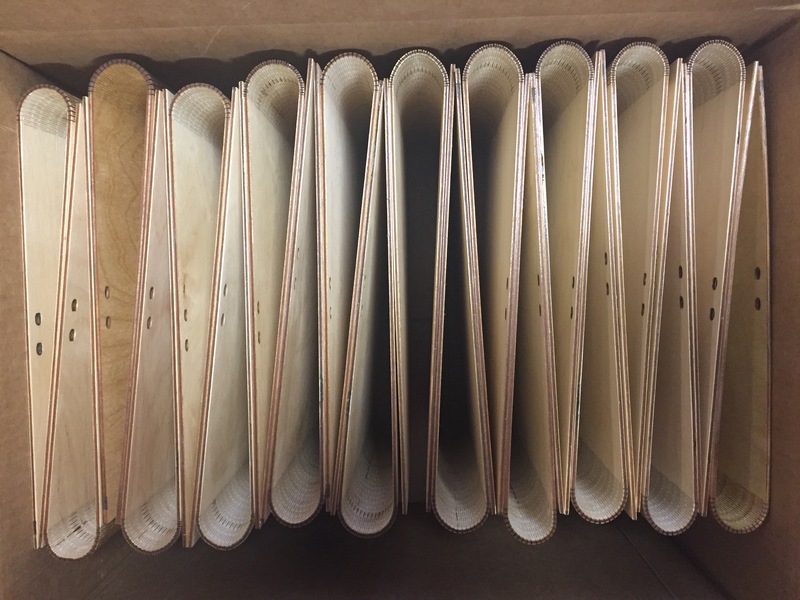 Denis Meehan, Director of Ecological Heating Ltd, explains how to reduce heat loss in a Victorian house while retaining the architectural integrity of the building.To download this report, please register below. 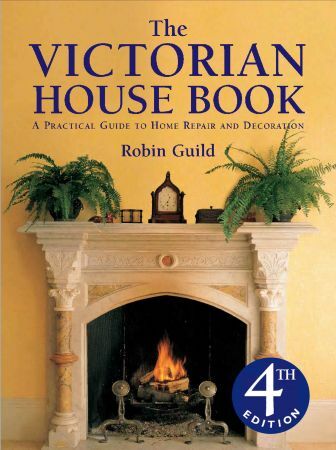 The editors of The Victorian House Book have compiled this list of more than 60 suppliers of goods and services appropriate to a house of this period, with profiles and pictures.To download this resource, please register below. 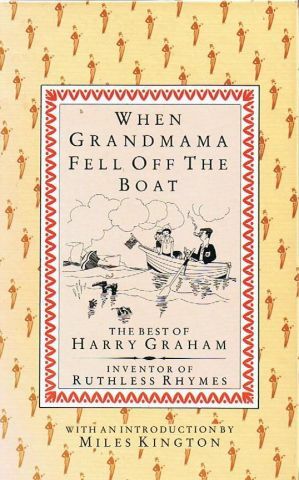 In this excerpt are four sample poems from When Grandmama Fell Off The Boat, an anthology of the humorous verse of Harry Graham, inventor of Ruthless Rhymes. Three are Ruthless Rhymes, including Grandmama, the baby in the Frigidaire and poor Billy, and you also have the much longer epic of The Bath, all with illustrations. To download this sample, please register below. These humorous verses were written for the Ruthless Rhyme competition in January and February 2012 and placed on the short list by the panel of judges named below. Included are the winning poem by Angela Perkins and the two runners-up by Rosemary McDougall and Elizabeth Francis. The other rhymes were written by Delia Chilom, Yasir Hayat, Diane Jackman, Katherine Lavender, Gwen de Mel and Elizabeth Sarah Pearl. To download the short list, please register below. The ten judges of the Ruthless Rhyme competition included past and present staff of Sheldrake Press, chaired by Simon Rigge, and four external moderators including the poet Charles Boyle, the historian Fergus Fleming, the publisher David Jefferis and the editor Mike Brown. To find out more, please register below. Many of the poems submitted in the competition were not strictly Ruthless Rhymes, as defined in the competition rules, but were thought worthy of mention for their intrinsic quality as verse or the fact that they were accompanied by rather good line drawings. To read them, please register below. Among the poems submitted in the competition, but adjudged not ruthless, were some which took the biscuit for their oddity or absurdity. To read them, please register below. On this day in 1852, the architect Augustus Pugin died at his home in Ramsgate, Kent. 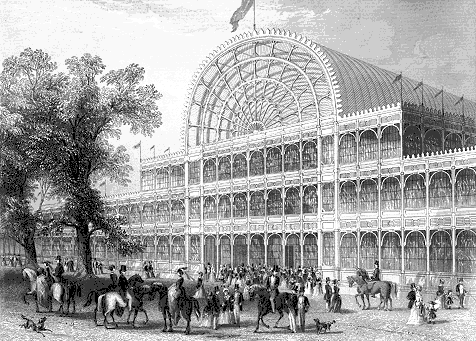 His most famous project was his work with Sir Charles Barry on the Palace of Westminster after the old building had been destroyed by fire in 1834. 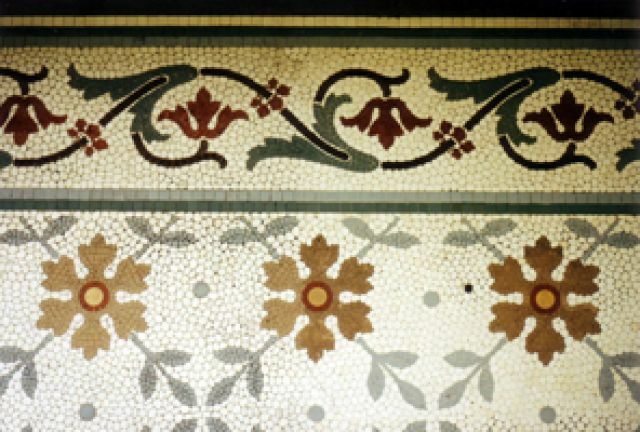 Pugin was responsible for the design of the interior and some of the exterior details. 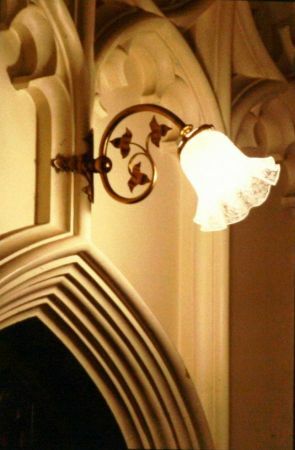 His contribution to architecture and interior design is covered extensively in The Victorian House Book, from which this detail in the Palace of Westminster is taken. The Pre-Raphaelite artist Edward Burne-Jones was born 178 years ago today. Inspired by the artists of the Italian Renaissance, his paintings depict graceful figures in meticulously detailed medieval settings and are often on mythological or religious subjects. 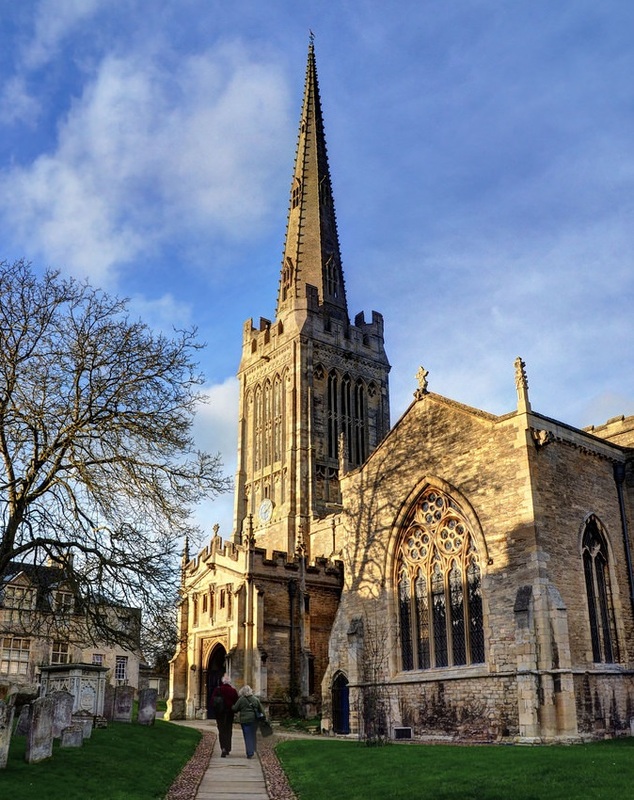 His interest in medieval art can also be seen in the stained glass and tapestry designs he produced for Morris & Co. 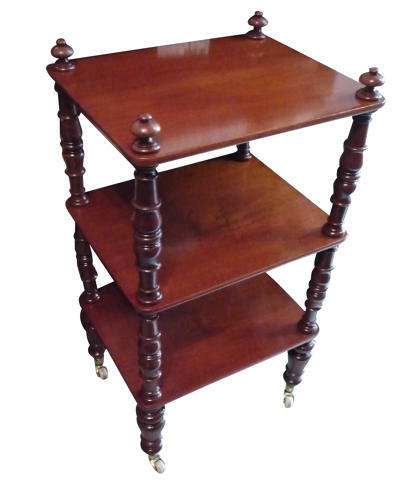 This example is taken from The Victorian House Book by Robin Guild. 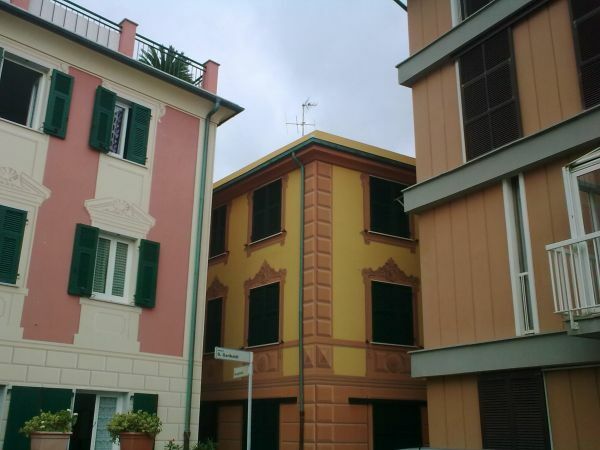 Here are three buildings in the seaside town of Moneglia in Liguria, northern Italy. Which do you prefer: (from left) A, B or C? We will explain the purpose of the quiz as soon as we have the results at the end of this week. Please express your preference by clicking here. On this day in 1870, the Anglo-French writer Hilaire Belloc was born in La Celle-Saint-Cloud, France. Although he wrote numerous works of history and biography, he is best remembered for his macabre humorous verse, such as ‘Matilda’. To find an equally naughty Matilda, go to When Grandmama Fell Off The Boat. The great days of railway luxury are returning. Today Top Table have a special offer on the St Pancras Grand, ‘a stylish, romantic destination restaurant’. When was the last time a railway dining room was connected with romance? Brief Encounter? 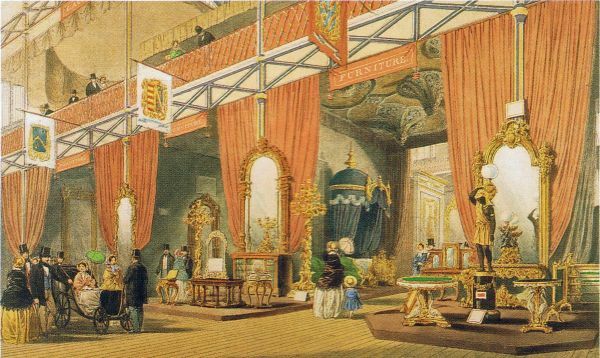 Early next year, the restored King’s Cross station will be unveiled, offering more 19th-century splendour. 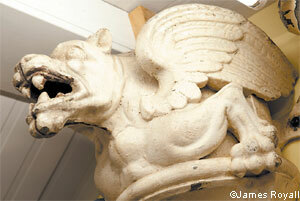 For a snapshot of the work in progress, see our Blog. Sir George Gilbert Scott is perhaps best known as the architect of the Albert Memorial in Kensington Gardens and the Midland Grand Hotel at St Pancras station. 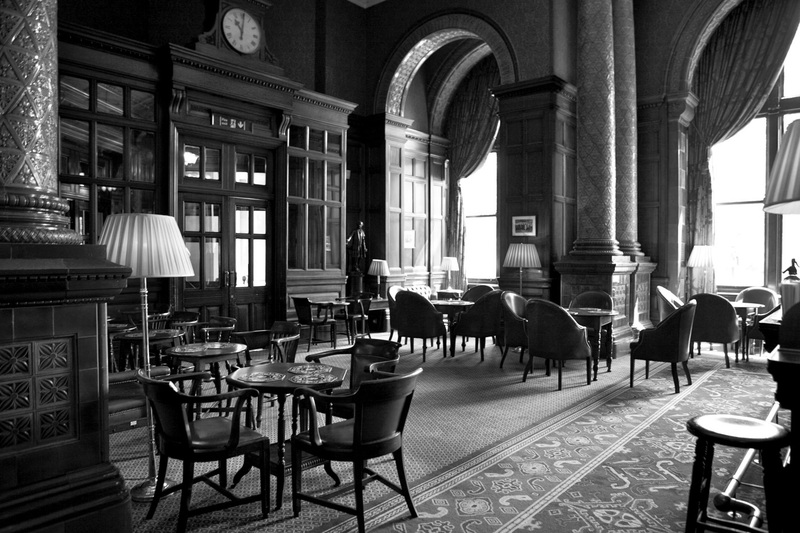 The hotel re-opened on 5th May 2011, with many of its original features restored. 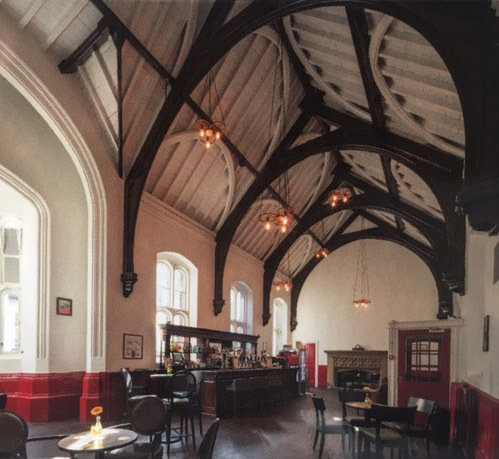 This is an achievement we could only dream of when we featured the hotel in The Railway Heritage of Britain in 1983. If anyone is still unconvinced of Scott’s standing as an architect, may we suggest a walk up his grand staircase at St Pancras. 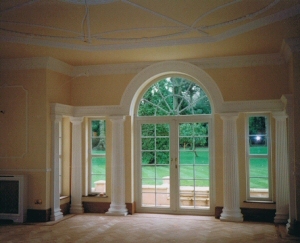 There is more on this subject in our Blog, and you can see an album of 21 photographs on our Facebook page. In Japan, frogs were thought to bring good fortune, allowing money to return to a person (the Japanese word for ‘frog’ is the same as ‘to return’). This little frog certainly looks as if he might have special powers, as he gazes up at the starry sky. 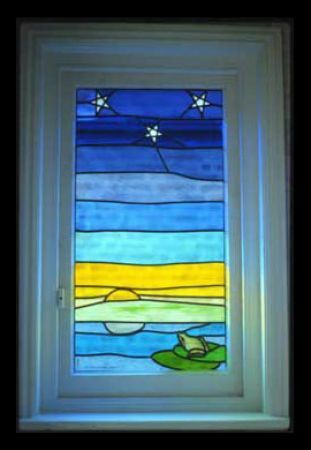 This is our favourite design by The London Stained Glass Company. 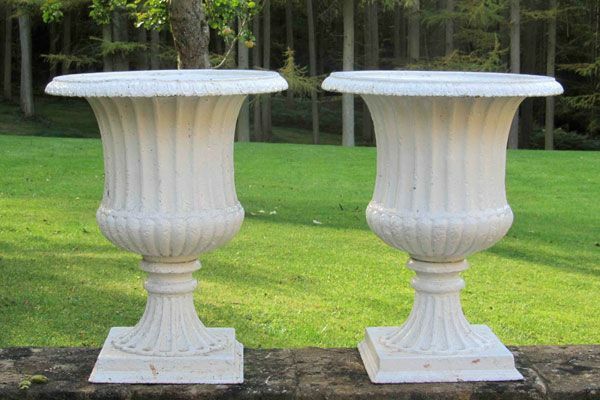 You can see more designs by visiting their web-site, which can be reached from Victorian House Decoration in Links. 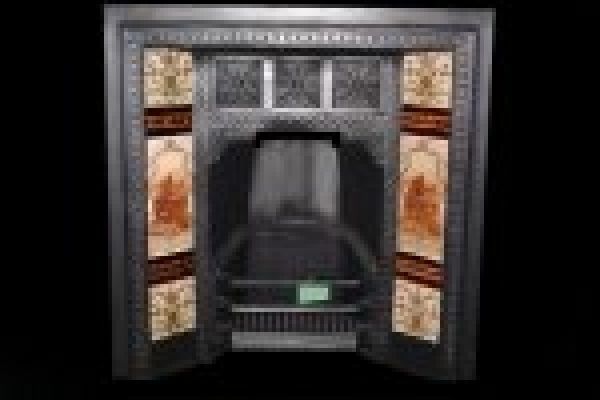 There can be no denying the importance the Victorians placed on first impressions, and with grandeur in mind they turned the front entrances of their houses into showcases of architectural detail and decorative art, in which stained glass was ever-present. 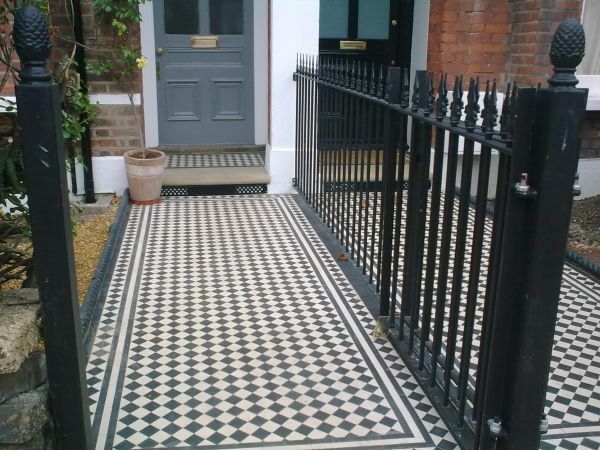 If yours is missing, and you want to commission a new design, have a look at Judi Stark’s portfolio, now available on our Victorian House Decoration page. 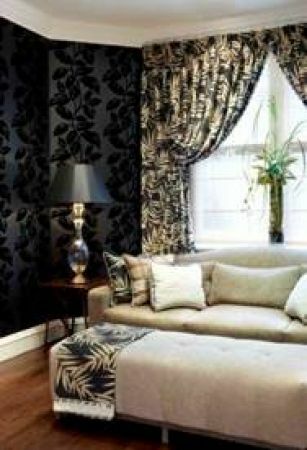 We have just added a link to Mr Jones of Muswell Hill, makers of curtains, blinds and traditional upholstery. 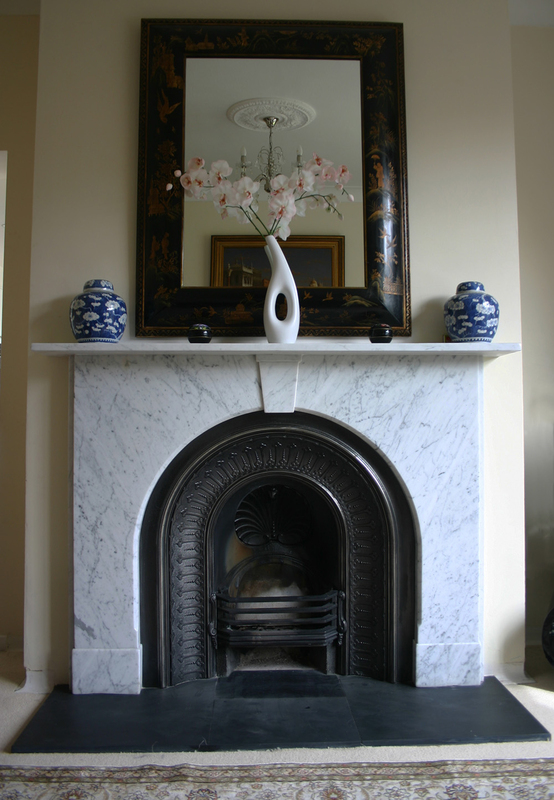 After more than 25 years, they have built up an in-depth knowledge of their subject and amassed a stock of designer fabrics and wallpapers which they claim is the largest in North London. 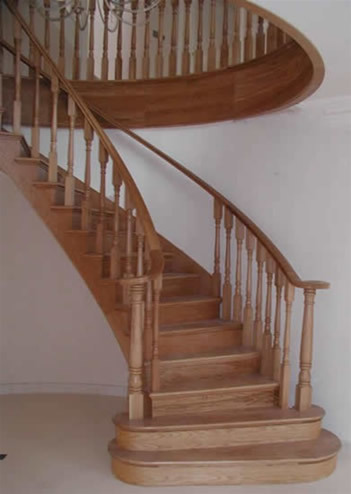 Do a one-stop shop with them, they say, and you will save yourself many frustrating hours of traipsing around. Put on his veil, and took the swarm. We have given a link to Thomas Crapper, who gave their name to an inglorious noun and verb. 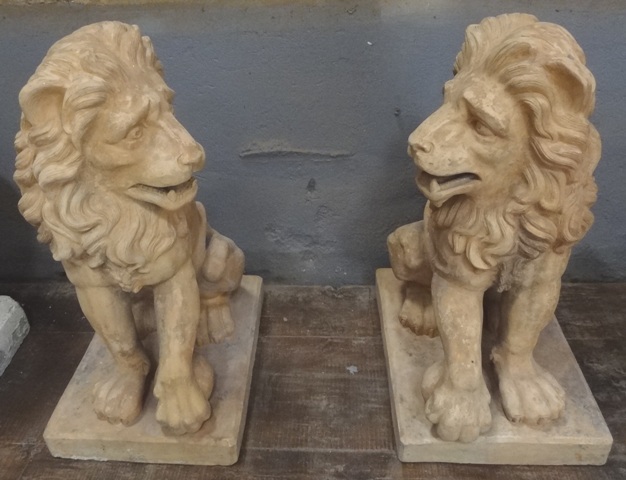 They are still trading on it, producing hand-made replicas of their firm’s products from the late-Victorian and Edwardian periods. 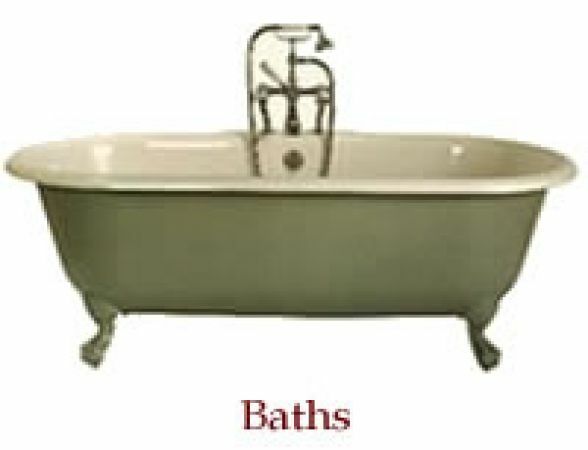 As you would expect, they do loos and W. C. seats, but they can also fit you out with baths, basins, taps and bathroom accessories which they claim are ‘ultra-authentic’ and not the ‘vaguely Victorian’ sanitary ware that is generally available. Lucinda Lambton and Adam Hart-Davis, among others, have written glowing reviews of their period detail and thunderous flush! 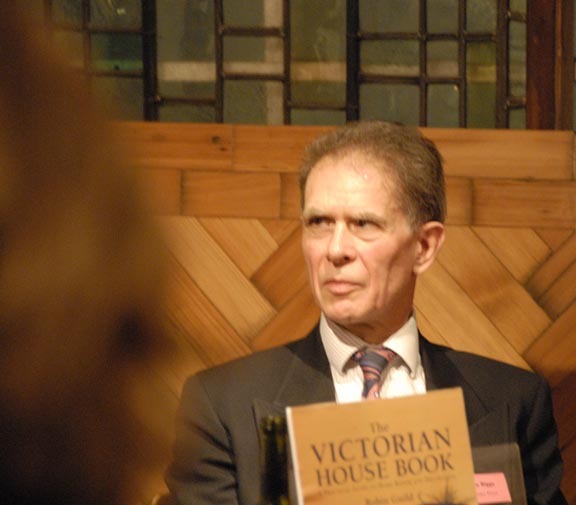 This is an excerpt from the Publisher’s speech at The Victorian House Book launch party, Brunswick House, Vauxhall Cross. Why did we do a book on Victorian houses? 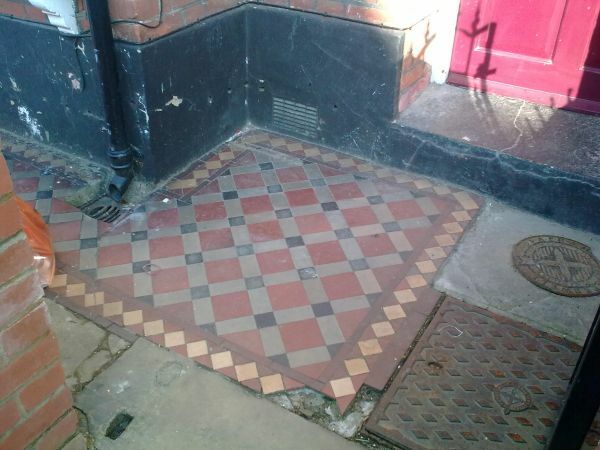 There are more of them in Great Britain than any other period house. A quarter of the British housing stock is Victorian. Nearly six million of us live in them and we all have to look at them when we walk or drive through our cities and towns. When I was a small boy living in Kent, my grandfather used to drive us up to London for a Christmas treat – Peter Pan on ice or Bertram Mills’ Circus – and as we made our way through the Victorian suburbs of Catford, Lewisham, New Cross, Peckham and Camberwell, I witnessed scenes of sad dilapidation. 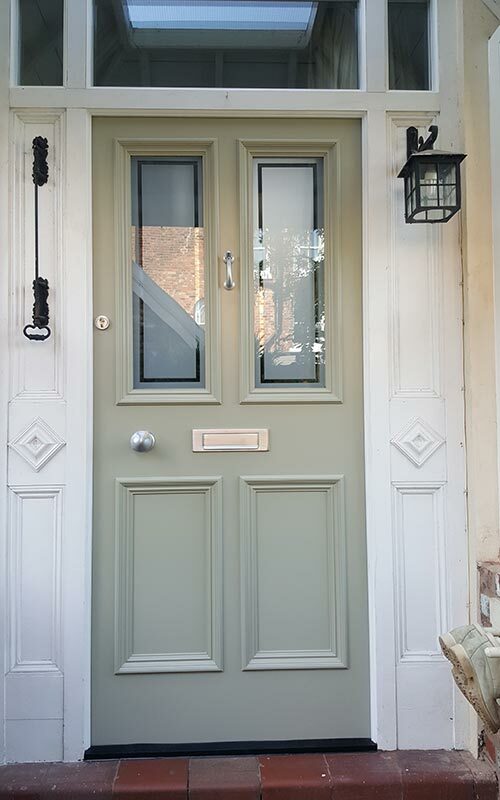 What had been Class I gentleman’s villas now had cars parked in their front gardens, garden walls crumbling, paint peeling off the windows, brickwork dark from London soot, front doors drab and cluttered with inappropriate ironmongery. Rows of plastic doorbells testified to the scourge of multi-occupation. 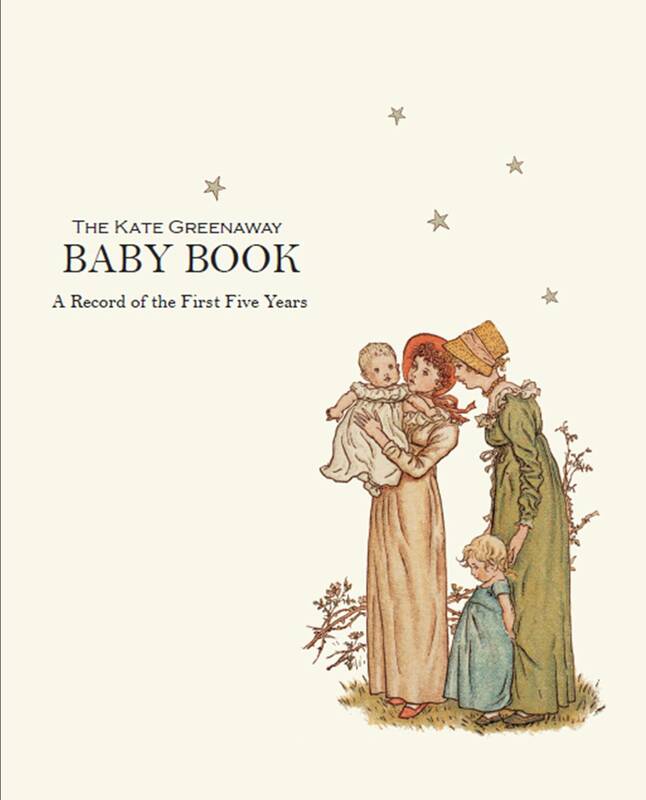 The new edition of The Kate Greenaway Baby Book has arrived. With a freshly designed cover by the award-winning artist Ting-Chung Cheng, the book combines traditional childhood images with a clean modern style. It has sections for parents to fill in with details of their child’s general progress, as well as important information such as vaccinations and illnesses. All of this is accompanied by beautiful images from one of the first book illustrators to have her work published in colour, and whose ability to capture the innocence of childhood won her lasting popularity. 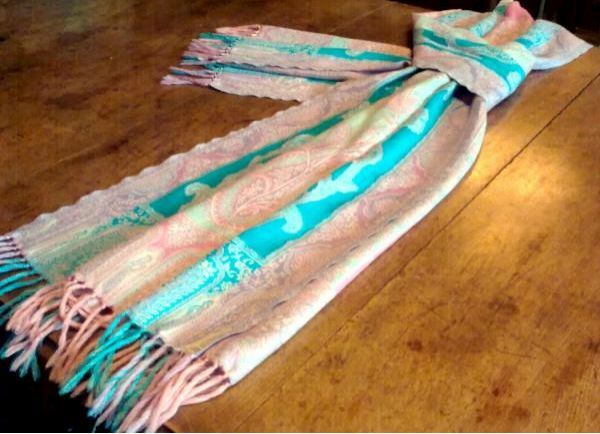 It provides an ideal gift for new and expectant mothers.